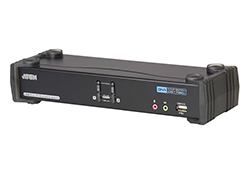 DVI-D/ DV-I & DVI-I(Dual Link) | Simply Connect Pte Ltd. The CM0264 2x4 DVI-HD Audio/Video Matrix KVMP™ Switch Dual Display Console supports one DVI display and one HD display, allowing users to access 4 computers/devices from a single console, consisting of USB keyboard, USB mouse, HD display, and DVI display. To improve the operational efficiency of intensive monitoring applications, there needs to be a fast and convenient way to view and manage more computers simultaneously, permitting faster response times from a single location. The CS1782A USB DVI Dual Link KVMP™ Switch charts a revolutionary direction in KVM switch functionality. It combines the capabilities of a 2-port KVM switch with a 2-Port USB hub, while providing a DVI monitor interface and audio support. The CS1784A USB DVI Dual Link KVMP™ Switch charts a revolutionary direction in KVM switch functionality. 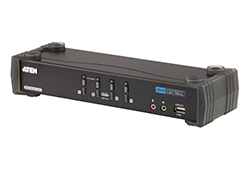 It combines the capabilities of a 4-port KVM switch with a 2-Port USB hub, while providing a DVI monitor interface and audio support.